During this week 9-13 of July the International IT Security Summer School takes place in Lviv, Ukaine. One of the partner of ENGENSEC project Lviv Politechnic University with pleasure supported School with classrooms and computers for providing trainings in cybersecurity. 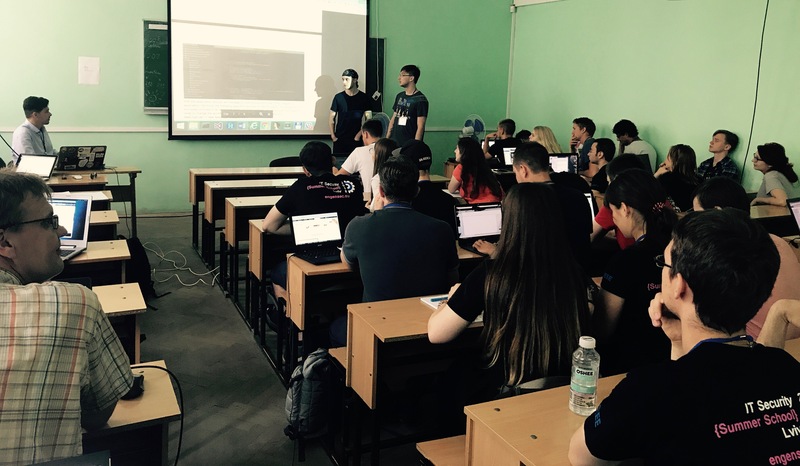 This is already 4th Summer school within project of Educating the experts in Cyber security. 45 student arrived to Lviv from Poland, Ukraine, Sweden, Finland, Netherlands, France, Luxemburg, Turkey. After arriving they got acquainted with each other and went to the center of Lviv. Most of students travelled by airplane or train except 4 students from Sweden, they were driving car through Poland. This Summer School united students from different countries and of different levels: bachelors and masters cooperate with participants from industry. The participants had already trainings on such courses as Malware Analysis and Software Security with skilled instructors who work at the industry and reflect their knowledge in the teaching process at their universities. Alexander Adamov who is the director of NioGuard Security lab and the teacher of Kharkov National University of Radio Electronics, Ukraine gave lectures in Malware Analysis course and Tomasz Surmacz who is teacher in Wroclaw University of Science and Technology, Poland and cooperated with companies such as APK Net Ltd, Ohio, USA, Siemens AG Wien, Austria, Siemens AG Wroclaw, Poland gave lectures in Software Security course. Participants were encouraged with challenges that were given to them by instructors, were tired but happy. They were divided by 7 groups with members from different countries that gave them the great opportunity to improve their English skills and socialize with each other. Also, each group had received the quest over the old town with tasks to find particular places and make selfies at that places. Each completed task give them additional points. The leader group with the highest score will receive gift from organizers. On Wednesday the participants also had guided night excursion over the town with mystical legends about Lviv. We should say thanks to organizers in Ukraine who helps to settle participants and for helping with adaptation to Ukrainian culture.